While your DSLR is loaded with features, functions, bells, and whistles, only a few of them matter when it comes to making movies. Here’s a basic primer on DSLR functions that matter to moviemaking. Video capture uses a small selection of the shutter dial, generally ranging from 1/30 of a second to 1/250 of a second. That pales in comparison to the range between 30 seconds and 1/4000 of a second for still photography. Although the video shutter speeds occupy a narrow band, they can still depict a low-light subject as well as depict the fast-motion gruesome detail of a zombie apocalypse. Current DSLR models do not look much different than the camera you’re probably familiar with using. In fact, with the exception of replacing film with a digital sensor, it even retains that timeless SLR look. What has changed is what these cameras can do, and that is . . . drum roll, please . . . make movies. The DSLR consists of two essential parts: the camera body and the lens. You need both pieces to take a picture or make a movie. Handgrip: Allows you to comfortably hold your DSLR when taking still images. Main dial: Lets you adjust shutter and other functions. Mode dial: Lets you make adjustments between exposure modes, including the movie mode. Shutter release: Activates the shutter when taking still photographs, but does nothing for movies. ISO set button: Used for setting sensor sensitivity. Remote control lamp (infrared receiver): Can communicate with wireless remote to control camera functions. Flash synch hot shoe: No, it’s not that incendiary party trick of yesteryear, the hot foot. Instead, this term refers to the sliding tracks on top of the camera’s viewfinder. How else do you think you’re going to mount that auxiliary microphone? Lens release button: Lets you release interchangeable lenses. Remote control terminal: The electronic version of the cable release plugs in here and allows you to activate the shutter without touching the camera. Useful for many reasons, but time-lapse especially, when making movies. External microphone terminal: Allows you to plug in an external microphone. Can also plug in to a line mixer. Audio/video out terminal: For playback on non-HD televisions and monitors. HDMI mini out: Lets you display the Live View images on another screen, such as an external monitor or television. Also allows for HD playback of material captured on card. 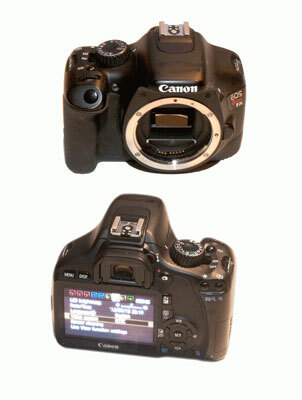 Display: Although the Rebel T2i does not have this feature, many DSLR models have it. This screen on top of the camera shows shutter speed, aperture setting, ISO, and other settings. Menu: The control center for the DSLR. Nested in its many menus and sub-menus are controls and settings for the camera, including white balance, custom functions, numbering, card settings, and dozens of other tools. LCD monitor: Allows you to preview the scene in the camera’s LCD screen. It comes in handy for letting you position the DSLR when making movies. Quick control button: Brings up quick access to select and control camera functions. Movie shooting button: Controls starting and stopping movie capture. Aperture/exposure control: Holding this button and turning the main dial lets you adjust aperture setting. It’s also used to set exposure compensation when shooting in an automated mode. Card slot: For loading SD digital media cards. Speaker: Lets you hear audio playback without headphones.